JOHN P. JOHNSON. The experiences of the people of Western Kansas as recorded on various pages of this publication seem to indicate that the successful man is he who is able to strike an average of many years of mingled ups and downs, vicissitudes and successes. There is no record of those many who came into the country, in the flush of enthusiasm, ventured their all, and after one or two years of disaster pulled away and went elsewhere. Nor is there any frequent record of the exceedingly few who found fortune almost at once as a result of several lucky years in succession. The real pioneers and the really successful men of Western Kansas are those who endured the heat and burden of the day when crops were poor, drought prevalent and every condition averse to their effort. Surely they above all others deserve the prosperity represented in $3 wheat. One of these is John P. Johnson, now living retired in a comfortable home at 823 Kansas Street in Larned. Mr. Johnson moved into the city from his farm in 1915 in order to secure better school facilities for his younger children. The story of his life begins with his birth on September 22, 1855, in Smoland, Sweden. A few years ago, in 1910, he went back to visit his native land. While there his cousin, who now owns and occupies the old homestead, showed him deeds indicating the lands to have been in the possession of their ancestors for 296 years. The first deed was written on a parchment of calfskin. Mr. Johnson's father was Johannas Johnson, a farmer, who was born and reared in that locality of Sweden and died there in 1857, at the age of twenty-eight. He was one of the victims of a plague which swept over Sweden and took away nearly all the young people. So devastating was this plague that when John P. Johnson was of age for military service he was almost the only boy in the township so available. Johannas Johnson was a son of Jonas Johnson, also a farmer, who died as an old man. Johannes Johnson married Sarah Peterson, daughter of Peter Alexanderson. She spent all her life in the same township of Sweden and died there in 1915, at the age of eighty-seven. John P. Johnson had two half-sisters and three half-brothers who came to the United States. Their names are William, Solomon, Jennie Carlson, Augusta Ulmquist, and Malcolm of the State of Washington. John P. Johnson attended school in Sweden to the equivalent of the eighth grade. He had suffered a severe illness as a child and the extremely cold climate of his native land proved too rigorous, and it was for that reason that in 1880, at the age of twenty-four, he emigrated to the United States. After passing through Castle Garden he found employment as a farm hand near Forestville, Connecticut. For seven years he was with the Union Iron Works of New Britain, Connecticut. Through that long and steady employment he was able to save about $1,000. While in Connecticut Western Kansas lands were extensively advertised, and there were also agents who influenced him and other workmen to invest their savings in the West. Mr. Johnson was one of about fifteen persons in his community who were influenced by these inducements and entered contracts and made the first payment on lands in Wallace County, Kansas. Among those fifteen people Mr. Johnson was chosen as the advance agent to come to Kansas and try out the experiment of homesteading, while the others waited until he could report to their satisfaction. His experience the first few years discouraged the others and they never made the second payment, losing all they had put into the proposition. The experience of Mr. Johnson was much worse. He lost not only his payments and the $1,000 of capital he had saved, but also $2,000 he had borrowed, all his time, but with all that he lived to see the time when there were no regrets, and in its place extreme satisfaction that he had made himself a part of Kansas. Ten years of the best years of his life were a complete failure as far as getting ahead in the world was concerned, and he was past fifty-one before he was entirely clear from debt. It was in 1888 that Mr. Johnson came from Hartford County, Connecticut, and located in Wallace County, Kansas. Besides the quarter section he had made a payment on the previous year he homesteaded an adjoining quarter. Both of these quarters he lost on account of crop failures. It was more than fifteen years before he was able to payback the $2,000 he had borrowed, and by that time the interest had made a total of over $5,000. For seven years he stuck to his post in Wallace County, and then turned over his land to the mortgage company and moved to Finney County. There he lived on a piece of school land and worked out as a farm hand at wages from 75 cents to $1 a day. He continued in that way three years. He was hardly able to make both ends meet, and he finally moved to Pawnee County and rented a half section in Valley Center Township. Here he continued work as a farm hand, but at the same time put in crops which proved in some degree satisfactory. In 1898 he bought the east half of section 2, township 23, range 15 in Valley Center Township. This land had some small improvements, including a six room house and a bank stable, and forty acres under fence. These improvements had a value of about $1,000. Mr. Johnson agreed to pay $2,500 for the land and improvements, though he was unable to pay a cent to bind the bargain. There was a mortgage for the entire amount. From his work as a farm hand he had saved enough to buy seed for 200 acres of wheat. The wheat came up but froze out in the spring and at the harvest and after he sold his grain he lacked $15 of having as much as it cost him to sow and harvest it, while his own labor went for nought. This was the seventh failure he had suffered as a wheat raiser. In those seven years he had sown 1,525 acres of wheat, an average of 200 acres to the year. His crop in 1899 returned him about 1,200 bushels, and in 1900 he had 5,000 bushels. Since then wheat growing has been quite reliable and he has averaged about 9,000 bushels every year. In 1892, in Wallace County, Mr. Johnson sold wheat at 40 cents a bushel. Recently, in 1917, he sold some of his hold over crop for $3 a bushel. The best yield he ever had was forty-three bushels to the acre on a small field of twenty acres. In 1914 he harvested 18,000 bushels. Mr. Johnson has done some notable work in improving his farm lands. In 1907 he built a modern ten-room, two-story frame house and in 1913 erected a barn 40 by 60 feet, with hip roof and enough room in the mow to hold feed for twenty-eight head of horses. His wheat granaries hold 15,000 bushels and he has a model corn crib, 40 by 42 feet, with cement floors and with a driveway clear through. This holds about 8,000 bushels of corn on the cob. Out of his generous prosperity of recent years Mr. Johnson has acquired some fine farm lands. In 1904 he bought the southwest quarter of section 2, township 23, range 15, at a price of $4,000. The land had no improvements then, though it was under cultivation. In 1910 he bought section 13 in the same township, paying $20,000. The land had improvements to the value of about $700. Mr. Johnson also owns stock in the grain elevators at Ray and Maxwell. For thirteen years he served as a member of the board of school district No. 31. He has never been active in politics beyond voting the democratic ticket. He is a loyal church member and is active in the Sunday school of the United Brethren Church. At New Britain, Connecticut, October 10, 1885, Mr. Johnson married Wilhelmina Peterson, who came to Kansas with him and shared in the discouragements and trials of the early years. She was born in Sweden December 12, 1857, a daughter of Peter Emangusson, who was a miller in Sweden. Mrs. Johnson had two sisters, both now deceased. 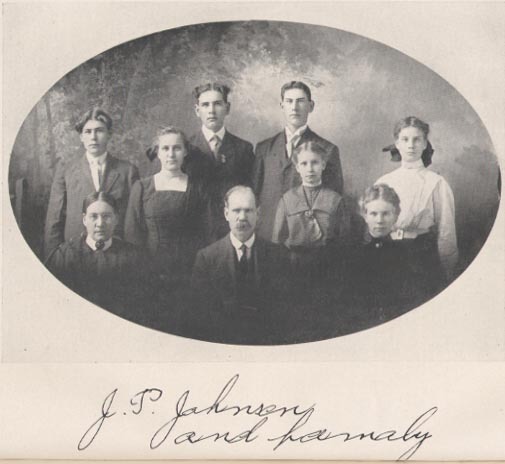 Mr. and Mrs. Johnson have reared a family of capable sons and daughters and have given them all the educational advantages possible, the boys attending the Agricultural College at Manhattan, while the girls all completed high school work. Charles P., the oldest, is still living in Pawnee County and is unmarried. Mamie is the wife of C. Walker of Pawnee County, and their children are Edna, Francis, Harold, John and Russell. David, a Pawnee County resident, is married to Elsie Huffman, and has children, Howard, Loas and Ruth. Esther is the wife of Herbert Mueller, of Stafford County, and they have one child. Ruth married Felix Huffman, of Stafford County. Oscar, now on the home farm, married Mattie Cunningham and has a daughter, Doris. Anna is the wife of Donald F. Smith, who is in the artillery in France.